For questions about any terms in this article, please see the Tissue Culture Glossary. To learn more and converse with other tissue culture experts, be sure to join the FlytrapCare Tissue Culture Forums. Tissue culture, also known as micropropagation, is a propagation method used to produce plants under sterile conditions. This method uses plant explants (plant parts) or seeds that have been sterilized before being placed in containers with a growing medium (usually a gel) that has some nutrients added. The explants or seeds, the containers and the medium have all been sterilized, and this (if successful) prevents any cut or torn tissue, or the entire explant or seed itself, from becoming infected with a microorganism of some kind and rotting during the time these plant parts require to become rooted or to multiply. Many types of seeds germinated in these conditions tend to grow very fast compared to being sowed in standard growing media outside of sterile, enclosed containers. Using plant tissue, it is possible to grow exact copies of the donor plant. This is extremely useful for plants that genetically have desirable traits because one can create many clones of a particular plant much faster than traditional propagation methods like cuttings, pullings or divisions. The sterile nutrient media usually contains a nutrient solution (typically salts and vitamins), sucrose (sugar), hormones (optional), antibiotics (optional), and a solidifying or gelling agent such as agar (a product of seaweed). Stage I. Establishment of an aseptic (sterile) culture. Stage II. The multiplication of propagules (a propagule is any part of a plant used to make or become new plants). Stage III. Preparation of propagules for successful transfer to soil (rooting and “hardening” (acclimating) outside of sterile conditions in regular growing media). Stage IV. Establishment in soil (or other appropriate growing medium). The main difference between tissue culture and propagation done by cuttings, pullings, divisions or seeds is that the plants grow faster (the nutritious gel medium helps) and one can multiply them rapidly by giving them the right hormones and dividing them regularly. In theory, you can create an infinite number of plants from just one piece of tissue, and many plants in a relatively brief period of time. 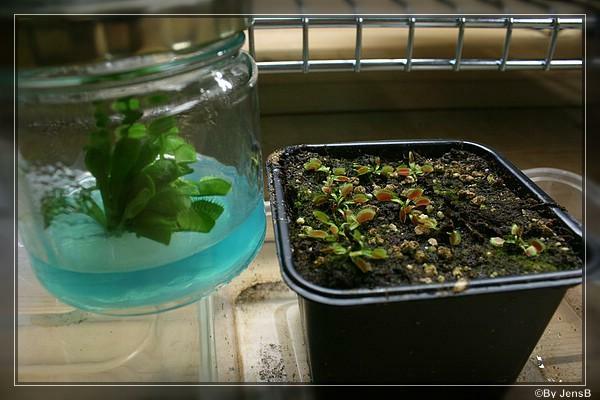 Below is a picture, courtesy of Jens Brettschneider, showing the difference in growth rate and plant size of seeds started at the same time, at left in tissue culture, and at right in traditional potting media. Baby food jars (tall ones are better). You need lots of them. I got a ton of them for $20 off of Craigslist. Also check with your local recycle center and day care centers. A good pH (acidity/alkalinity) meter. You can use paper litmus strips, but they are very hard to get an accurate measurement with. A pressure cooker for sterilizing media and instruments. The basic stuff that you probably already have around the house including bleach, hydrogen peroxide, alcohol, sugar, distilled water, baking soda, vinegar and a teaspoon measuring set. Some sort of hood to work under. I use a 30 gallon aquarium laid on its side. Many people use a plastic storage bin, upside down with a hole cut out of the side. Laminar Flow Hoods are the ultimate work areas, but are somewhat expensive. A spray bottle to mist the inside of the work area. I highly recommend that you join the Home Tissue Culture Group run by Carol Stiff, http://www.kitchenculturekit.com/, and purchase a kit to start with. It is a non-profit organization focused on helping people learn the skills needed to successfully tissue culture at home. She also sells nearly all supplies you would ever need and certainly more than enough to get started in the hobby of home tissue culture. Another similar site that sells kits and supplies is http://www.planttc.com/. Phytotech Labs, http://www.phytotechlab.com/, is a great source for all tissue culture equipment. Their prices are competitive and they have good service. Here are a few more similar sites that sell to home tissue culturers. Plant Preservative Mixture (PPM) can be purchased from here: http://www.ppm4plant-tc.com/. It is almost a requirement to use PPM unless you are starting the hobby with a laminar flow hood, which is unlikely. If you order a kit from the Kitchen Culture Kit site by Carol Stiff, you’ll get all the instructions you need for preparing media. Media preparation is somewhat dependent on the type of plant species you’re attempting to put into tissue culture. Many species of plants can be cultured on full strength Murashige and Skoog (MS) with vitamins. For carnivorous plants, it’s best to use 1/2 or 1/3 MS with vitamins. There are, of course, other types of media that could work as well, but for simplicity sake, let’s just discuss using MS.
1/2 MS medium with vitamins (one half of a 1 liter packet or 2.2 grams). Most Tissue Culture Techs uses 1/3 MS for Carnivorous plants with great results. 1 ml of BAP (1 mg/ml) – leave this out for seeds. It’s even optional for explants. Dionaea explants will form callus without it. Fill a 1 quart or 1 liter container with 3 cups of water. Add MS medium (1/2 packet or 2.2 grams) and 2 tablespoons of table sugar and mix well. Measure 1 ml of BAP and 1ml of PPM and add them to the solution. Add food coloring (if desired) to indicate BAP media. Test the pH. A pH between 5 and 6 is preferred with 5.6 to 5.8 being optimal. If the pH is too low (“acidic”) add a VERY small amount of baking soda to the solution, remix it well and remeasure. If the pH is too high (“basic”) add a few drops of vinegar to the solution, remix it well and remeasure. Continue doing this until you reach the desired pH. Once the desired pH is reached, start dispensing the media to the baby food jars. (NOTE: Some people add the agar first, but in my experience this causes some jars to be too soft while others are rock hard. I’ve found it better to add the agar after dispensing). You can put in 25ml or 50 ml into each jar. Add the agar to the jars. For 25 ml of media, I use a “smidgen” spoonful and for 30ml to 50ml I use a “pinch” spoonful either level (for 30ml) or heaping (for 50ml). NOTE: You can also add the agar or other gelling agent (Gelcarin GP812, etc.) to the media before dispensing to the baby food jars. Agar isn’t soluble in water at room temperature so you’ll have to heat the media to near a boil to dissolve it. Gelcarin is soluble in water at room temperature, so you can add it before dispensing. For most applications I use between 6g and 8g of gelling agent per liter of media. Cap the jars and place them in the pressure cooker, microwave or other autoclave device in preparation for sterilization. Be sure to check out all of Frank’s amazing tissue culture videos that he’s uploaded to YouTube. Or join the Home Tissue Culture Group and get a DVD with all of them compiled on it. Media sterilization can be done in the microwave or in a pressure cooker. I’ve only ever used a pressure cooker because, in my opinion, it’s a much more reliable method. If using the microwave, you can end up boiling the media over or not getting it sterilized completely. There’s a fine line you have to walk when using the microwave, so I’ve just avoided it. Perhaps the most important part of having success with explants is selecting the right tissue and starting with clean tissue. To dramatically increase your odds of success with an explant, keep the plant that you plan to harvest the explant from growing in very clean conditions. You can even cover it with a plastic bag or grow it indoors under lights. Rain and wind carry all kinds of bacteria and mold spores in them and onto the plant, making it very hard to get clean without killing the plant tissue. Select a piece of tissue that’s clean, young and appears to be disease free. Harvest the cleanest, youngest piece of tissue you can. I’ve been growing any plants that I want to put into TC indoors to help keep them clean. Thoroughly rinse the tissue under warm running water for 20 to 30 minutes. I usually start the wash with antibacterial soap that has triclosan in it (either Dial complete or a similar generic brand). Then after some time (15 minutes?) washing/soaking in the soapy water, I just run it under water. Quick dip in 91% alcohol. For small pieces of tissue I skip this step because it seems to me that alcohol can quickly kill the tissue. Transfer to 3% H2O2. For small tissue, leave it in for 3 to 5 minutes. Larger tissue, 5 to 7 minutes. I shake the container vigorously during this time. Transfer to 200ml of 10% to 20% bleach (I change it between 10%, 15% and 20% and it doesn’t seem to make much of a difference) with 6 to 8 drops of Tween 20. Again, the amount of time in the bleach varies depending on the size of the tissue, but it usually ranges from 6 minutes to 12 minutes. I shake the container vigorously during this time. Two 3 to 5 minute rinses in sterile water and then transfer to media. One important thing to note is that I keep my forceps in rubbing alcohol (isopropyl) to keep them sterile. Before I handle the tissue, however, I move the tips of the forceps into the flame of an alcohol lamp and then rinse them in sterile water. The first time I attempted TC, I failed to do this which resulted in small amounts of alcohol being on the tissue and getting on the media. That’s one main reason my first few attempts at TC were such epic failures. BE SURE TO RINSE THE ALCOHOL OFF OF YOUR FORCEPS BEFORE PUTTING THE TISSUE INTO THE VESSEL. It is primarily used for “firming up” media. You add it in powder form to the media, heat it to a boiling temperature to melt the agar, and then when the media cools back down, it “gels.” The purpose of agar is to provide a stable partially-solid surface on which the explant or seeds can rest and anchor themselves (when and if roots grow) without being immersed, but still have it soft enough so that nutrients and water may be extracted from it. Another gelling agent that’s becoming more widely used is Gelcarin GP812, or carrageenan. It is much clearer than agar when it sets up and it has a different consistency. It’s much easier for it to break apart, so in larger vessels, it may be better to use agar. There are other gelling agents that are available including gellan gums, agarose, alginic acid and more. I’ve only used agar and Gelcarin and both of them are inexpensive and work well. For those people that are lazy (just kidding), there are pre-made media mixes that you can purchase. If you are unsure what kind of media you have, you can figure it out by seeing how much the package tells you to add for 1L of media. If it is just the MS media, it will be 4.33g/L, if it contains agar, it will be 9-12 g/L. Laminar flow hoods are ideal, but they aren’t necessary for starters. They are expensive and most people simply can’t afford to spend $500+ on a piece of equipment when starting a hobby. Many people have had excellent results without the use of expensive flow hoods. Working in overturned plastic containers with the side cut out or aquariums laid on their side are very good methods. Once you’ve successfully established an explant or seed in vitro, the fun begins! Plants should be grown under moderate lighting on a fairly long photo period. I like using two 32 watt T8 bulbs with a 6500 kelvin color temperature on a 16 hour photo period placed about a foot away from the cultures. I try to keep the temperature stable around 78°F (25°C) and, at a minimum, always between 72°F (22°C) and 82°F (28°C). Most species of carnivorous plants will grow quickly with this set up on the proper media. When the plants start slowing in growth or the jar gets full of tissue, you’ll need to “replate” or “subculture” (propagate) that tissue. Prepare your desired media and, in your sterile work area, remove the tissue from the jar it’s growing in. If you simply need to replate (transfer the tissue to a new jar with fresh media without dividing), then just pull it out of the old jar and place it in the new media jar. If you need to divide and “subculture” the tissue, then you’ll have to have a sterile work area to set it on so it can be divided or cut into pieces. I typically put a dinner plate into the pressure cooker along with some paper towels wrapped in aluminum foil. I use the plate and paper towels as my sterile work bench for dividing tissue. For Dionaea muscipula, or the Venus Fly Trap, it’s usually fairly easy to simply pull apart the tissue into manageable pieces and then put those into new cultures. Sometimes it’s necessary to use a scalpel (surgeon’s knife) to cut the tissue into pieces and then plate it onto new media. Venus fly traps will form callus (lumpy tissue growth from which many plants grow) and multiply fine on 50% MS with no hormones at all, but many other species of carnivorous plants need plant growth regulators (PGRs) to grow faster and/or divide. The amount and type of PGR you use is dependent on the desired result. You’ll have to experiment to figure out what concentration and which PGR gives you the growth you’re looking for. A fairly well known multiplication media for Drosera and Venus fly traps is 50% Murashige and Skoog (MS) media with full MS vitamins, 30g/L sugar, pH of 5.6 and 0.5mg/L of Kinetin. This stage involves treating the plantlets/shoots produced to encourage root growth and “hardening.” It is performed in vitro, or in a sterile “test tube” environment. Root growth does not always occur in the earlier stages in plant cell culture, and is of course a requirement for successful plant growth after the micropropagation procedure. It is often performed in vitro by transferring the plantlets to a growth medium containing auxin(s) which stimulate root initiation. The pretransplant stage is not always performed; Some plants are micropropagated and grown in culture and normal cuttings are made that are then rooted ex vitro. “Hardening” refers to the preparation of the plants for a natural growth environment. Until this stage, the plantlets have been grown in “ideal” conditions, designed to encourage rapid growth. Due to lack of necessity, the plants are likely to be highly susceptible to disease and often do not have fully functional dermal coverings and will be inefficient in their use of water and energy. In vitro conditions are high in humidity and plants grown under these condition do not form a working cuticle and stomata that keep the plant from drying out, so when taken out of culture the plantlets need time to adjust to more natural environmental conditions. Hardening typically involves slowly weaning the plantlets from a consistent high-humidity, low light, warm environment to an environment with variable humidity, light and temperature, and more like the natural environment of the plant. This process often requires that the humidity be maintained at a high level initially with regular mist watering or conditions in which there is little moving air and the humidity can be somewhat contained or localized (by placing a ventilated plastic covering over the plants for some days or weeks, for example). The key to successfully transferring your in-vitro plantlets into soil is to be very fastidious about washing off all the TC media from the roots. Place the plantlet under running, tepid water, and use the force of the water to thoroughly dissolve off all the old media. If this is not done, then molds will frequently feed on the remaining gel media, take hold and overpower your plants. After planting out, treat the plants the same as they were treated while still in-vitro. A humidity tent made with a plastic bag will help the plants acclimatize. Let them stay sealed for a week or so. You can then gradually open up the bag over the course of another week to get the plants used to lower humidity. However, be sure to keep them out of direct sunlight during this time or their comfortable ex-vitro nursery may become a solar oven that bakes and kills them.Once they are “hardened off” properly, you can treat them as any other soil-grown plant. What are the colors I see in some people’s culture media? These are simply food colouring added in to be able to distinguish different media types, or hormones added to the media. One exception to this is the addition of activated charcoal which will make the media a dark grey-black colour. Plant hormones, also know and plant growth regulator or PGRs, are signal molecules produced within the plant at extremely low concentrations. Plant hormones regulate cellular processes and growth of the plant in various ways. In tissue culture, plant hormones are added to the media to promote a certain type of growth (division, root formation, etc.) depending on what is desired by the propagator at the time. How do I sterilize seeds? Most species of carnivorous plant seeds are relatively easily sterilized. For first time tissue culturers, I would definitely recommend starting with seeds as explants can be very difficult to properly sterilize. One can hone their tissue culture skills with seeds and then move onto explants when they have a good sterile technique. I’ve used the same procedure for Dionaea, Drosera, Darlingtonia, Cephalotus and Sarracenia seeds and it works really well. Quick dip in 91% ethanol alcohol. 2 to 3 minutes in 3% Hydrogen Peroxide. Soak in 10% bleach. 6 minutes for Drosera and Cephalotus, 10 minutes for Dionaea seed, 12 minutes for Sarracenia. Transfer to media – I use forceps to pick up each individual seed. A wire ring works well too. I have also successfully sterilized Dionaea seed by simply doing a 10 minute soak in 10% bleach followed by a 3 minute rinse in sterile water and the transferring to media. How do I sterilize water? The same way that you sterilize the media, in a pressure cooker or a microwave. How do I make 10% Bleach? For making small amounts, mix 10 ml of bleach to 90 ml distilled/RO water. I usually sterilize the water in the pressure cooker first. How do I make 3% Hydrogen Peroxide? 3% Hydrogen Peroxide is readily available in pharmacies and drug stores. Do I have to use PPM? You can either use PPM or make a media without it. There is less chance of contamination when using PPM. A callus of cells is a mass of undifferentiated plant cells. It often starts as a lumpy growth on existing tissue and can develop into odd-looking, perhaps “hairy” masses as many tiny plantlets begin to emerge from the callus. Charcoal which has been treated to remove hydrocarbons and to increase its adsorptive properties. It acts by condensing and holding a gas or solute onto its surface; thus inhibitory substances in nutrient medium may be adsorbed to charcoal included in the medium. Rooting factors such as phenolamines present as contaminants in charcoal may stimulate growth in vitro. Its addition to rooting medium may stimulate root initiation in some plant species. Activated charcoal may differ in origin and in composition. cf charcoal; phenolic exudation. How long does it take to see callus formation on an explant? It all depends on the species of plants and which part you use for the explant. It can show up in a matter of days, but it could take months.